The new year is here - I would like to wish all of you a very Happy New Year. I hope 2018 is filled with love, and good health. This fun card folds up flat for mailing. The set I'm using today is the Charm Accordion. I have photos to show you of how I made my card but you may want to take look at Karen's video on how to assemble this die set. You can see the video by CLICKING HERE. 5 panels (shown in red). 6 decretive scroll pieces for the top. I cut the numbers with my electronic cutter but you could use any numbers you may have in your stash like stickers or chipboard numbers. Arrange the panels in a row, I used temporary tape on the back to hold them together until I added the stars. Add decretive panels (shown in the harlequin pattern). Add squares at an angle on each panel. Add connecting panels between each red panel making sure to alternate on mountain and one valley. Using the same die as the red panels, cut one panel for front of card. Cut out interior panel leaving a window. This panel will fit on the front of card and allow accordion panel to move. Cut several stars, one of the charms included in the die set, from coordination paper and add to card. Optional - add Wink of Stela to stars. Using the Words Set 4, Just A Note die set, cut the word Hooray and add to front. The die set comes with different charms that can be added to the inside of the connecting panels but I decided to leave mine empty but, of course, you could add them if you like. What a fun card to ring in the new year Sandy! Happy New Year to you and your family! This is a spectacular and sparkly card. Happy New Year to you too. Hooray indeed! What A FUN card! 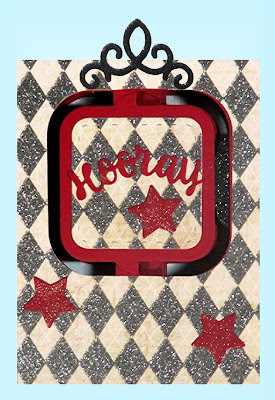 Love that accordion die and your glittery papers! The colors are perfect to welcome in this New Year! WOW this is fabulous ... what a fun creation! Happy New Year to you & your family! Awesome inspiration ... thanks Sandy! What a fun card ! Happy New Year! the perfect card and a great design! love all that glitter! Such a fun card fold and design ... perfect to start the year!